I just bought my first BMW, Love it!! Battery was dead, radio on code, dealer wants $50.00 to reset code, I'm not sure the old cassette radio is worth $50.00 but I can't seem to figure out how to remove the radio. I even have BMW car radio removal tool that fits in the four outer holes, but won't budge. Any advise would be great. The code card just might me in your manual. I found mine in the maintenance section. It was listed in 2 areas as well. Hopefully you have the complete records with the bike. Once you have the code all you do is turn the radio knob on. No lights or anything will come on. then once you turn it on either the 4 digit code to the corresponding start ion preset numbers on the radio. It will then come alive. Maybe you can just by the code from the dealer?? I have the tool to remove the radio cassette from my old K1100 LT if you need it. Here is a picture of what the tool looks like. Don't need it anymore since the 1100 was sold years ago. It's not necessary to get hold of the official BMW tool to remove the radio. 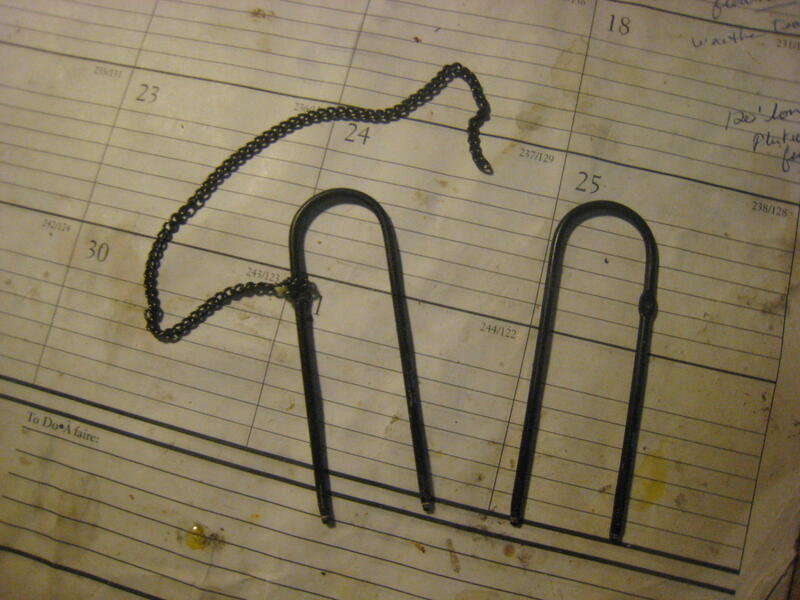 I fashioned two "U" shaped pieces of heavy wire that fit into the two holes at each END of the radio. The tool should be 2-3 inches long. The wire easily depresses a flexible metal plate with small catches on it. A gentle tug on the ends of the radio casing should start the radio sliding out. It might feel sticky at first because of the radio connector in the bottom of the box. Once that comes loose, out she comes! New to me '97 K1100LT. I have the radio working after entering the code. Only one of four speakers works having adjusted both balance knobs. I'm trying to remove the radio to look at the connection or reseat to see if there's anything to help get the other speakers functional. I can't seem to release the radio with the U-shaped tools. I slide them in until I hear a 'click', no luck. I continue to slide them down, no luck. I push as hard as I can and seat the tools to the very bottom, no luck. Any tips?